The long awaited removal of the cast occurred eight weeks after surgery. The doc said things look okay and cleared me to wear the boot or shoes as I desire. His main admonition is not to do anything that would put stretching force on the tendon. Clearly not body weight. That is what the boot is for…to prohibit ankle joint flexing beyond 90 degrees. Essentially, the clearance to wear shoes is at my own risk. Other bloggers here have made it clear that there are real risks to reinjury at this stage in recovery. My first day in the boot was not ideal. I have an office job, so he said just walk as much as needed. Well, my daughter’s Indiana University freshman orientation was the next day and I went. This involved a fair amount of walking around campus, but I didn’t want to miss it. Although I got tired, it sure was a lot better than it would have been on crutches! The next day my hips were sore from a lot of walking with legs of different lengths. My boot has a taller heel than the shoes I was wearing. At home I have been wearing running shoes most of the time. Since my ankle is still kind of big, I have been using an old pair of my sons shoes that are one size larger than my normal size. Although it is slow getting around since I cannot bend my joint past 90 degrees, it feels great to be out of the boot for a few hours each day. The doctor cleared me to ride an indoor bike, provided I don’t bend the ankle joint or put much force on the tendon. I was relieved to hear this since I bike a lot. 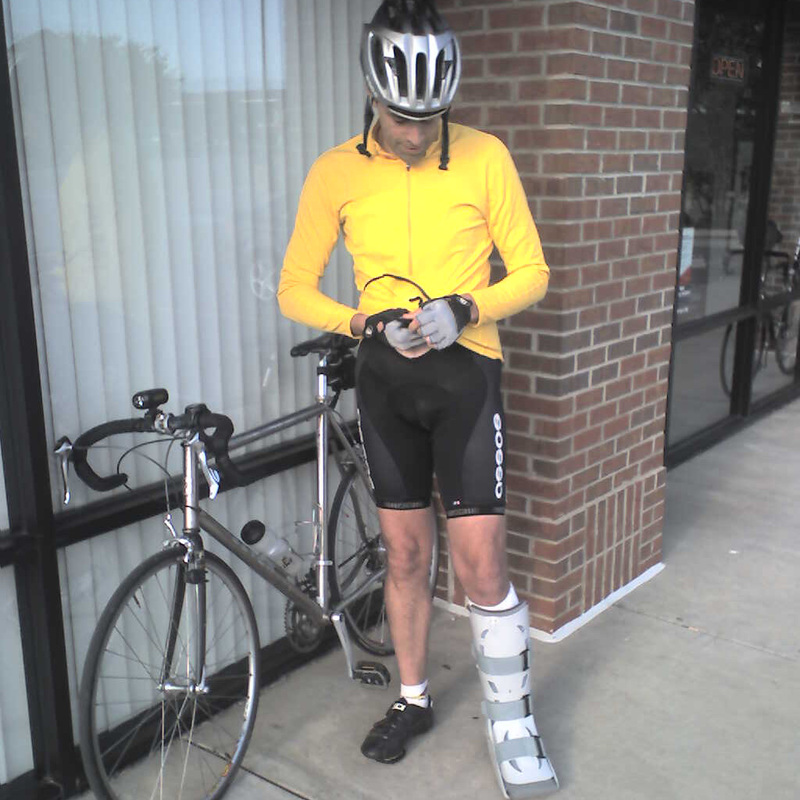 However, about mid-week I got this crazy idea that I could ride my road bike with the boot on. I would just take the clipless pedal off and put a platform pedal on. I wouldn’t be breaking the doc’s guidance because I wouldn’t be bending the joint…it will be protected in the boot. Likewise, if I was to crash for some reason, I think the boot would provide pretty good protection for the tendon. I gave it a provisional try on Thursday night for a couple hundred yards and all seemed well. Yesterday I went on a leisurely 15 mile ride and again, all seemed fine. There was a little heel pain after awhile, but it didn’t seem like an issue. After taking off the boot and sleeping on it, still, all seemed okay. Today I pushed a good bit more, going on a 40 mile ride and averaging about 17 mph. I am pushing some with the left leg, but the right leg is doing the lion’s share of the work. At the end of 40, it was pretty tired. Does anybody have experience to suggest I shouldn’t be doing this riding with my boot on? Hours after the cast came off (8 weeks post-op) Biking today…halfway through 40 miles.